Sullivan Property Consultants are delighted to present to the market this impressive five bedroom detached residence. 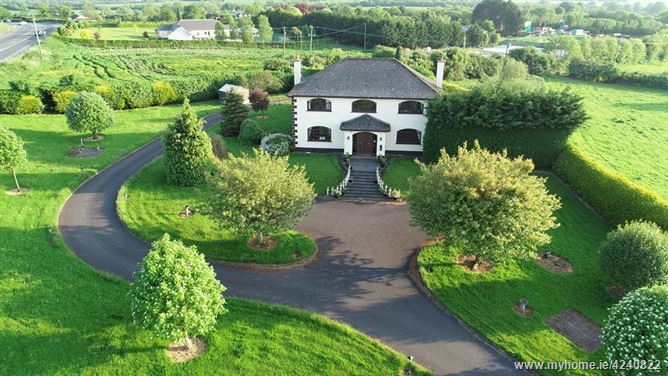 Nestled in the heart of the Boyne Valley region on approximately 1.5 acres of private mature landscaped gardens this property, with some modernising, would make a delightful family home. Accommodation briefly comprises reception hallway, sitting room, sun room, TV room/ bedroom, kitchen/living area, dining room and five large en suite bedrooms. There is also a double garage attached to the property which has been converted to an apartment. The property is located approximately 2kms south of Slane on the N2 and approximately 20 minutes from the towns of Navan, Drogheda and Ashbourne and 40 minutes from Dublin city centre. Slane village offers an abundance of amenities ie shops, restaurants, cafes, primary school, crèche and health centre to name a few. Carpet floor. Double doors to sitting room off. Double breasted front door. Stairs off. Very large spacious room. Centre & ceiling coving. Carpet floor. Large marble feature fireplace with open fire. TV point. Double doors to sun room off. Double doors to hall off. Double doors to dining room off. Wood floor. T&G ceiling. Sliding door to patio area off. Originally a bedroom with en suite off. Marble fireplace with real fire and back boiler. Centre and ceiling coving. Carpet floor. Fully tiled. Pump shower. WC & WHB. Fully fitted oak kitchen. Built in dishwasher and Leisure electric oven and hob. Tiled floor and splash-back. Down-lighters. Stove. Open kitchen into living area. Door to hall off. Door to dining room off. Wood floor. TV point. Fitted units. Wood floor. Centre and ceiling coving. Double doors to sitting room off. Fully tiled. WC & WHB. Pump shower. Window. Fully tiled. Triton T80 electric shower. WC & WHB. Hand rail. Window. Has been converted to an apartment. Wall to wall built in wardrobe. TV point. Carpet. Fully tiled. Triton T90si shower. WC & WHB. Light over sink. Shelving. Double wardrobe. TV point. Carpet. Fully tiled. Triton T902 shower. WC & WHB. Fully tiled. Corner bath. Bidet. WC & WHB. Centre coving. Large window with views of Slane. Carpet. Slide robes. TV point. Carpet. Fully tiled. Triton T90i electric shower. Extractor fan. WC & WHB. Wall to wall wardrobe. TV point. Carpet. Fully tiled. Pump shower. Extractor fan. WC & WHB. Sweeping tarmac driveway. Approximately 1.5 acres of mature landscaped gardens. Six bedrooms all en suite. Garage converted to an apartment. Approximately 1.5 acres of mature landscaped gardens. Over looking parts of Slane village. Heating – Oil Fired Central Heating. • These particulars are only a general outline for the guidance of intending purchasers and do not constitute in whole or in part an offer or a Contract. • Whilst every care has been taken in the preparation of these particulars, and they are believed to be correct, they are not warranted and intending purchasers should satisfy themselves as to the correctness of the information given. • All statements in these particulars are made on the without responsibility part of Sullivan Property consultants or the vendor. • No statement in these particulars is to be relied upon as a statement or representation of fact. • Neither Sullivan Property Consultants nor anyone in its employment or acting on its behalf has authority to make any representation or warranty in relation to this property. • Nothing in these particulars shall be deemed to be a statement that the property is in good repair or condition or otherwise nor that any services or facilities are in good working order. • Photographs may show only certain parts and aspects of the property at the time when the photographs were taken and you should rely upon actual inspection. • No assumption should be made in respect of parts of the property not shown in photographs. • Any areas, measurements or distances are only approximate. • Any reference to alterations or use is not intended to be a statement that any necessary planning, building regulation, listed building or any other consent has been obtained.